Wake to the sound of the water lapping against the shore - just 10' from the cottage. 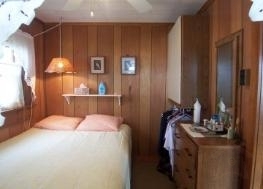 2br - has a double size bed, dresser, cabinet and hanging rod for clothes. 1 Bathroom with shower. The kitchen is fully equipped with a full size electric range/oven, refrigerator with ice maker, and all small appliances. All the pots & pans,dishes, flatware, glasses, etc. 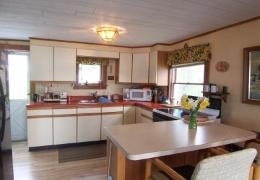 you need to prepare & serve meals & snacks are provided. A gas grill is on the street side deck,with 2 picnic tables. 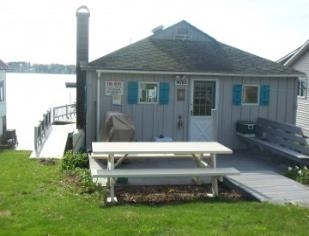 The "front room", facing Little Sodus Bay, has a large table and chairs, and a sofa & recliner.Next to the kitchen is a futon, 2 chairs,TV/VCR/DVD/CD player, AM/FM stereo/ tape deck. No cable = no channels.Thru sliding glass doors, you'll love the 19' X 30' deck, and 8' X 50' dock. 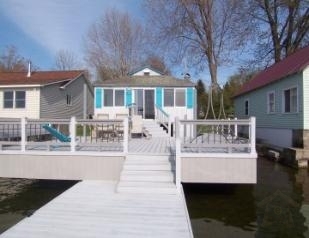 The covered boat lift has room for your boat. Bring your canoe, jet ski,etc. We have table/ chairs/ umbrella/ lounge chairs/ swings for your comfort. The water is about 8' deep at the end of the dock, and clear, so you can see the fish swimming, and warm enough for you to swim and play. The bathroom has a shower. Fair Haven is a small town on the South East "corner" of Lake Onterio. 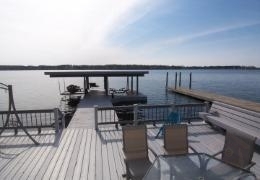 Little Sodus Bay is the 3rd largest bay off the lake - about 1 mile wide x 2 miles long. The street by our vacation rental cottage is a dead end, so there's little traffic. It is peaceful and quiet. The State Park is about a 20 minute walk away, with a sand beach and pier. The library in town has computers /internet available. You can also borrow movies a DVD player, VCR, books and exchange paperback books. 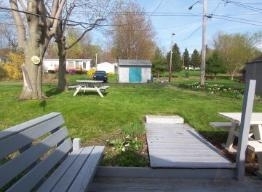 You can connect to wi-fi outside at the cottage. The local grocery store has the essentials. There are several good restaurants within a 20 minute drive. Deposits: $200 security deposit & half of rent due when making reservation - Balance due 14 days before arrival.